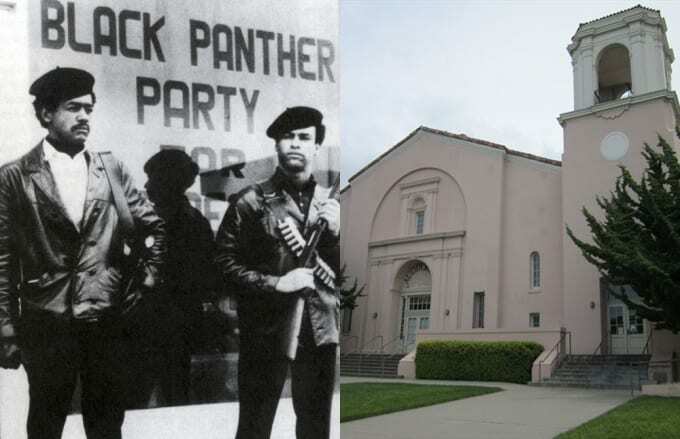 Location: 5714 Martin Luther King, Jr. Way, Oakland, Calif.
Bobby Seale and Huey Newton met at Oakland's Merritt College, a two-year community college named after physician Dr. Samuel Merritt. They joined the Afro-American Association (AAA), but were disappointed with the organization's decision to merely analyze problems facing the black community rather than act on them. In 1966, Seale and Newton formed the Black Panther Party for Self Defense (the name was eventually shortened to the Black Panther Party). And while Newton and Seale criticized the AAA for failing to take action, calling the Panthers "active" would be a gross understatement. In addition to educating African-Americans about their individual rights, they were heavy in the community, installing numerous social programs. Merritt College has since moved, but the original site was located at what was previously University High School at 5714 Grove Street. That's since been renamed 5714 Martin Luther King, Jr. Way, and is the north campus for the Children's Hospital and Research Center Oakland. It was added to the U.S. National Register of Historic Places in 1992.